TRIBLIVE —Rental properties in Allegheny County should be inspected for lead in their paint and water each time they are sold to a new owner, a county lead task force recommends. The recommendation was among two dozen suggestions in the task force’s report released Tuesday . A rental inspection program in Rochester, N.Y., was identified as a model of what the task force would like to see in Allegheny County. Under that program, each time a rental property is sold to a new owner, the municipality inspects it to make sure its paint and water do not contain unsafe amounts of lead. Landlords would need to obtain “lead-free/lead-safe” certificates before they could rent a property to tenants. A database of properties would be available to the public. Allegheny County’s large number of municipalities — 130 — could make the program a challenge, since properties would need to be inspected by municipalities, not the county. “In order to do something like that, it’ll take a cross-jurisdictional effort … and also take some additional resources,” said the director of the county Health Department, Dr. Karen Hacker, who headed the task force. Rochester has examined 141,000 properties since it started its program in 2005, Hacker said. Starting such a program in Allegheny County would likely require local legislation, Hacker said. Under current policies, public housing properties are routinely inspected for lead but other rental properties are not, Hacker said. 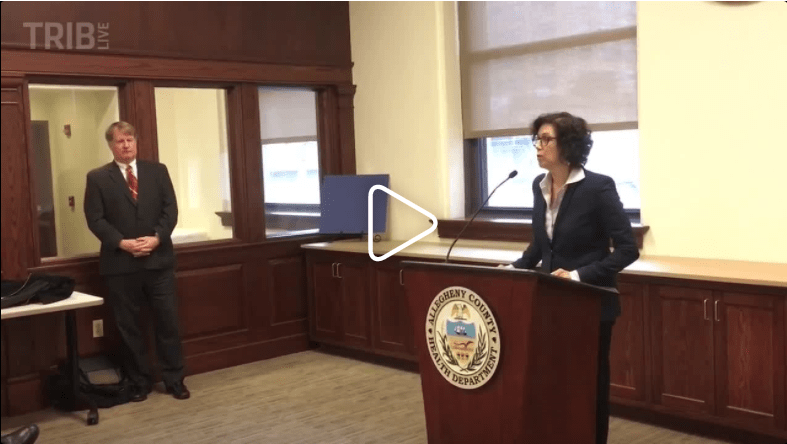 Michelle Naccarati-Chapkis, executive director of the Pittsburgh-based Women For a Healthy Environment, said her organization supports the county pursuing a rental inspection and searchable database program. The task force also urged the county to launch a new lead task force of county residents, Hacker said. That group could help get the word out about lead education and persuade parents to let Health Department inspectors examine their homes if their children have high lead levels, she said. Sometimes parents deny access, which means county inspectors can’t find the source of the lead. The task force also recommended new ways to monitor and educate the public about the issue. The department recently received 15 applications in response to a request for proposals from companies interested in helping with a lead education effort, Hacker said. Hacker announced plans to launch the task force in April, the same day county Controller Chelsa Wagner announced her office would audit the Health Department’s efforts to combat lead-related problems. In announcing the audit, Wagner cited media reports, including a Trib story that revealed the county had rarely penalized landlords for lead paint in homes where lead-poisoned children live. The nine-member task force, including local officials and physicians, began meeting in May. The group spoke to 20 local and national experts, reviewed literature and studies on the topic, spoke to parents of children with high lead levels and collected public comments, Hacker said. The task force was part of an ongoing multi-pronged approach to combat the lead issue. The county’s mandatory lead testing requirement starts Jan. 1. The county’s 2018 budget includes two additional full-time county lead inspectors, County Executive Rich Fitzgerald said. That brings the health department’s total to three full-time lead inspectors, Hacker said. Fitzgerald said he hopes to keep the task force group together for another year, even though the report is finished. Naccarati-Chapkis said she hopes her organization and other community-based groups will be able to help implement some of the suggestions in the report.